Home /Blog/What Is Twitter and How Does It Work? 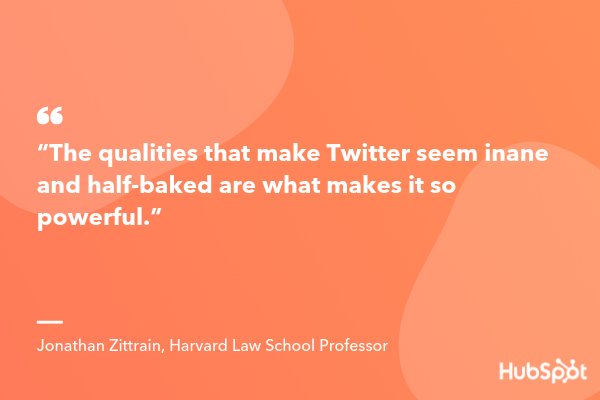 But its popularity can be intimidating — if you don’t know how to use Twitter in 2019, should you even bother trying to join the masses who’ve acquired years of experience on the site? Fortunately, Twitter is incredibly easy to use. Here, we’ll cover what Twitter is, who uses Twitter, and how you can get started on the site, today. In 2006, Jack Dorsey, co-founder of Twitter, had an idea — he would create a SMS-based communications platform in which friends could keep tabs on each other by updating statuses. In the beginning, Twitter was an idea all-too-similar to texting. The idea evolved, in large part due to brainstorming sessions with Dorsey’s co-founder, Evan Williams. Twitter began as an SMS-based platform, so the 140 character limit was initially simply a necessity — mobile carriers imposed the limit, not Twitter. However, as Twitter grew to become a web platform, they kept the limit simply because it aligned with Twitter’s brand — Twitter is a platform that aims to create highly skimmable content for our tech-heavy, attention-deficit modern world. Twitter has grown exponentially over the past 10+ years. Its purpose is ultimately to spread information fast — while that information is not always serious (Kim Kardashian’s thoughts on makeup, for instance), it sometimes is (like when Iranian protesters used Twitter to assemble marches). Twitter is a social media site, and its primary purpose is to connect people and allow people to share their thoughts with a big audience. Twitter allows users to discover stories regarding today’s biggest news and events, follow people or companies that post content they enjoy consuming, or simply communicate with friends. Additionally, PR teams and marketers can use Twitter to increase brand awareness and delight their audience. It’s important to note, you can use Twitter to advertise your products or services, but you should do so sparingly. Like any social media marketing strategy, your primary focus should be on attracting an audience with useful content and growing brand awareness. Additionally, you can use Twitter to connect with your audience in personal and meaningful ways. If someone mentions one of your products or services, you can “like” or “retweet” their comment. Alternatively, if a customer complains about your services on Twitter, you can reach out to rectify the situation in real-time. Twitter has often been used to spread breaking news quickly — at times, it’s even faster than traditional media outlets at spreading groundbreaking information quickly. Additionally, many celebrities, athletes, and politicians choose to post on Twitter directly rather than speaking through media outlets when they want to share information with their fans — so Twitter is often a helpful avenue when you’re looking for insider information or direct quotes to use for an article. Of course, there’s a danger in using Twitter as a primary source of news — the limited character count, for one thing, enables Twitter users to spread one-sided information without having the space to offer the full-story. If you’re a reporter, it’s likely best if you use Twitter to post short snapshots of larger events, but stay clear of offering controversial opinions when you don’t have the text space to back it up. If you work in PR, you might consider using Twitter to post announcements about one of your clients — for instance, you could tweet about a release date for a client’s product, or an upcoming event. Twitter can also help you quickly figure out what your client’s competitors are discussing, to ensure your client is up-to-date on industry trends, and participating in the larger conversation. You can use Twitter for entertainment purposes, or to stay in contact with friends and family. At its most basic, Twitter is similar to sending out a 140-character mass text to everyone you know — you could use it to share a funny story, post a compelling video, or ask your audience a question. The choice is yours. Twitter is a social networking site in which you can post 140 character status updates, otherwise known as “tweets”, that can be seen by anyone who has chosen to follow you. Within the tweet, you can link to other articles or videos. Additionally, you can scroll through your Twitter homepage to see what other people, who you’ve chosen to follow, are posting. For instance, you can use Twitter for professional use only, and choose to follow industry leaders in your field. Alternatively, maybe you just follow comedians, and use Twitter as a source of amusement. If you’re ready to get started with Twitter, here’s how it works — don’t worry, it’s relatively simple. If you’re interested in posting something, you’ll want to click the text box that says “What’s happening?”. You can include pictures, a GIF, or a poll using the icons below the text box. If you’re not sure what to post, consider pasting a URL into the box of a funny video or interesting article, with your own brief personal take on the content. When you’re ready, press “Tweet”. Also, yes — I should probably read through my 100+ notifications. To peruse popular content, you can click the “Moments” section at the top. This will show you trending topics in a variety of subjects, including News, Sports, Entertainment, and Fun. To follow specific people, you can type their name into the search box. When you click on their name, you’ll be directed to their profile. There, click the “Follow” button to the right to begin following them — this means any tweets they post will appear on your homepage. To engage with someone else’s content, you can “Retweet” it. This allows you to share someone else’s tweet with your own audience, and to show your agreement or approval of the tweet (for instance, if someone posts a video of a good song and says “This is the best song!” and you retweet it, you’re signaling to your audience that you also like the song and want to share it). Alternatively, you can click the speech bubble to the left of the Retweet button if you want to comment on the tweet, or the heart to the right of the Retweet button if you want to “like” the tweet. And that’s it! You now know how to post a tweet, engage with other Twitter users, follow people, and peruse popular content on the platform. While there’s still other handy tips and tricks to figure out, you have the basics down.